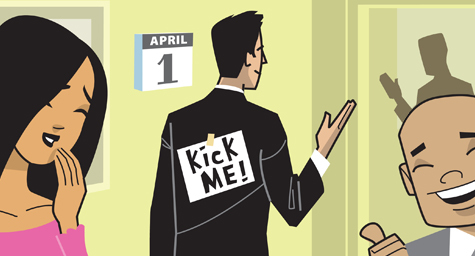 Advertising is no joke, but it quickly becomes a laughing matter each year on April Fools’ Day. And with the power of social media to instantly spread a message, marketers have gotten much more playful with the pranks they post online. It may be because these social media platforms stimulate people and any news or anything new sparks the interest of fans and followers. For a look and a laugh at the marketing jokes that have surfaced on social media platforms, The New York Times featured some finds that have teased and pleased audiences. Following FreshDirect’s great success with a timely tease last year, the online grocer had a new trick up its sleeve this year. They used their social media pages to announce the introduction of eagle-caught salmon. What made the phony food so funny was their description of how it was sustainably harvested deep in the wild by special FreshDirect eagles that they dressed in green and orange ribbons for both tracking and fashionable flair. For the followers who were fooled at first, they went on to explain how the salmon was biked into each store daily and suggested cooking by placing butter into talon holes. Many food brands served up April Fools’ Day fun. Cheetos got cheesy by debuting a perfume called Cheeteau that celebrated its iconic cool mascot, complete with its own website and black-and-white ads. And Tic Tacs turned to Facebook and Twitter to tease about a new shake-less container that would silence the shaking sound to stop others from asking for candy. This year, automakers got mileage out of April Fools’ Day by announcing crazy car models and funny features. Mazda jokingly made their sporty MX-5 into a family four-seater while BMW taunted audiences with the addition of a Force Injection Booster that made driving slow feel fast. And MINI Cooper claimed to roll out a T model that would run on tea. And leave it to Google to have the last laugh. The search giant created a YouTube video to announce the ridiculous release of “Pokémon Masters,” which would allow people to virtually capture animated Pokémon characters using Google Maps. Social media has made it easier than ever for advertisers to fool around on April Fools’ Day, but only time will tell if their tricks do to the trick to seriously boost business. Have the first look and the last word in advertising. Contact MDG Advertising today at 561-338-7797 or visit mdgadvertising.com.